Friday night kicks off the weekend with the Super Kids Race @6:30 pm. Make plans to bring your good signs, ring those cow bells, and cheer on our friends in the Super Kids Race. Tons of fun activities planned with give aways, bouncer, mini track racing, and Hoptown's finest Holiday Burger Food Truck. Beginning at 7:00 pm will start The Pit Crew Single Elimination Race. After all the hard work the pit crew engineers have put into their Champ's car getting ready for race day, they deserve to have a little fun too. Wonder what Big Kid will take home the very 1st Golden Wheel Trophy? Saturday racing begins at 8 am for Stock, Super Stock, and Master divisions. This is a double elimination race. The 1st place winner of each division will earn a spot in the 82nd All American Soap Box Derby World Championship on Saturday, July 20, 2019 at the world famous Debry Downs in Akron, OH. In 2018 Miss Ashton Grace brought home the 1st place trophy in Local Super Stock from the World Championship. RACER REGISTRATION IS NOW OPEN - registration packets can be printed from this website. Open the Boys & Girls between the ages of 7 yrs old up to 20 yrs. old. STOCK DIVISION - Must be 7 yrs old and no older than 13 yrs old on race day. SUPER STOCK DIVISION - Must be 9 yrs old and no older than 18 yrs old on race day. MASTERS DIVISION - Must be 10 yrs old and no older than 20 yrs old on race day. SUPER KIDS - Must be 7 yrs old and not reach 19 yrs old by July 19, 2019 with a weight limit of 185 lbs. $50 Registration fee can be in a form of sponsorship and tax deductible. CARS ARE AVAILABLE FOR LOAN. NO NEED TO BUY OR BUILD A CAR. Car Workshops gives you and your racer time to work together with guidance from our highly trainer "soap box mechanics". PLEASE SCHEDULE A TIME SLOT WITH THE RACE DIRECTOR FOR 1 OF THE 2 WORKSHOPS. This will help reduce the amount of time spent processing your Champ and the car thru various inspections and adjustments. Expect to spend approximately 1.5 hours working on the care to be safe and race ready. Following are a few items you may find helpful: WD40, 1500 grit auto sandpaper, car cleaner and spray wax, battery powered screwdriver. RACERS ARE ENCOURAGED TO BRING EXTRA WEIGHTS DUE TO LIMITED SUPPY (varying weights of 2, 5, & 10 lbs- please see rulebook for size and placement) Area metal compaines can cut metal plates to help achieve desired wight distribution for your racer. NEW CHANGE THIS YEAR WITH THE CAR WORKSHOPS IS THAT RACERS CAN IMPOUND THE CAR AT THE END OF THE WORKSHOP IF THEY SO CHOOSE. ONCE THE CAR HAS BEEN IMPOUNDED NO MORE ALTERATIONS WILL BE ALLOWED. AWARDS PRESENTATION IMMEDIATELY FOLLOWING RACE, DOOR PRIZES AND GIVE AWAYS WILL BE ANNOUNCED THRU OUT THE RACE. 1st Place winners of each division will be awarded a travel stipend. 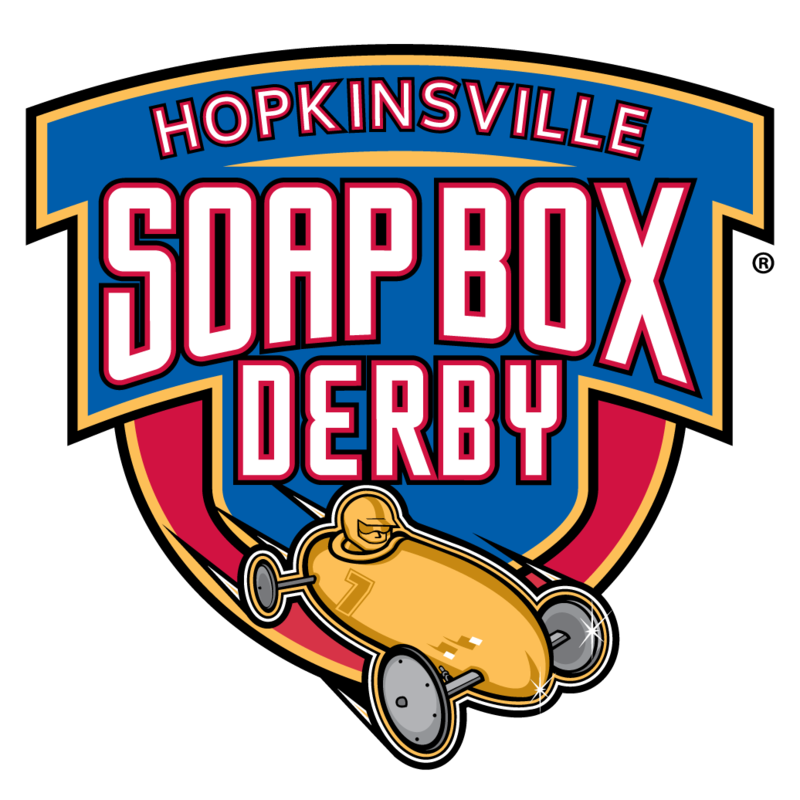 Winners will represent Hopkinsville in the All American Soap Box Derby World Championship Race @ Derby Downs in Akron, OH. The race week is July 14 - July 20, 2019. National Super Kids Classic will race Friday, July 19, 2019. The AASBD World Championship Race will race Saturday, July 20, 2019. The race can be seen by live stream on You Tube. Visit www.aasbd.org/raceweek for more details.